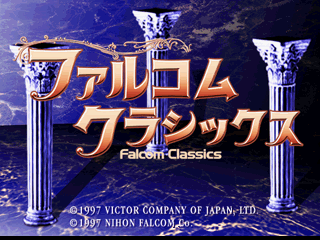 Falcom Classics (ファルコムクラシックス) is a compilation of three classic games by Falcom for the Sega Saturn. Each game has been enhanced to take advantage of the superior specifications of the Saturn console, though their non-enhanced counterparts can also be played. The compilation was followed by Falcom Classics II. Main article: Falcom Classics/Magazine articles. Disc 1\SMP_ABS.TXT TXT (Abstract) 190 About this game. Disc 2\FC_ABS.TXT TXT (Abstract) 131 About this game. NEC Retro has more information related to Dragon Slayer. NEC Retro has more information related to Xanadu. NEC Retro has more information related to Ys.